Day 6.. favourite colour family.. now, I know what some of you (who have been followers for awhile) will expect me to go with greens.. because, well, green is my favourite colour. This is a true fact. BUT. In the nail polish world.. my favourite colour family.. is.. BLUE. I have yet to come across a blue polish that I don't like. True story. I feel like all the shades compliment my near translucent, pale skin. 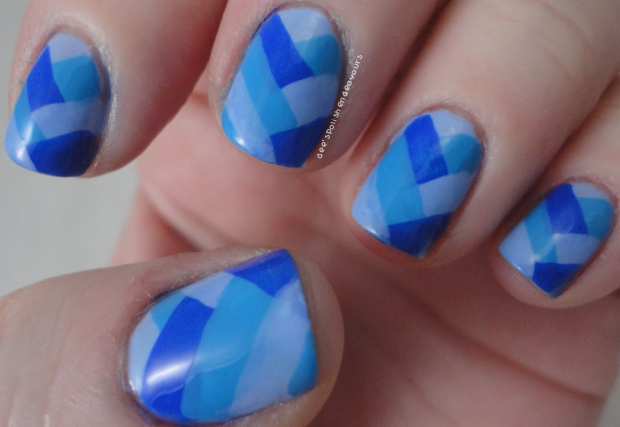 I followed (sort of) this awesome TUTORIAL to create my blue fishtail nails. Oh, and I love them. I actually look forward to doing this a bunch of times with other colour combos. This is fun and easy to do - but it looks like it is a lot of work. Those are the best kind of manis! Take care everyone - see you again soon! They look so amazing - I've never tried a braided mani but they are so nifty and you pulled it off perfectly. Thank you very much! You should definitely try it out - it is a lot of fun! !